Washington: With its "mobile-first, cloud- first world" concept, Microsoft aims to reinvent productivity to empower every person and organisation on the planet, company's CEO Satya Nadella said on Monday. "This is a bold ambition with massive opportunity for our partners as we design Microsoft experiences that you can creatively extend for every individual and business on the planet," Nadella said in a letter to Microsoft's partners at the 2014 Worldwide Partner Conference, which kicked off in the US Capital on Monday. Nadella is scheduled to deliver key note address to the 2014 Worldwide Partner Conference on Wednesday. The four-day long conference is being attended by some 150 participants from India. "The day I took on my new role I said that our industry does not respect tradition ? it only respects innovation. I also said that in order to accelerate our innovation, we must rediscover our soul ? our unique core," he said. Last week in an email to employees, Indian American Nadella shared how as the productivity and platform company for the mobile-first, cloud-first world, Microsoft will reinvent productivity to empower every person and organisation on the planet to do more and achieve more. "In this new world, there will soon be more than 3 billion people with Internet-connected devices ? from a farmer in a remote part of the world with a smartphone, to a professional power user with multiple devices powered by cloud service-based apps spanning work and life," he wrote. "The combination of many devices and cloud services used for generating and consuming data creates a unique opportunity for us. Our customers and society expect us to maximise the value of technology while also preserving the values that are timeless," he added. "We will create more natural human-computing interfaces that empower all individuals. We will develop and deploy secure platforms and infrastructure that enable all industries. And we will strike the right balance between using data to create intelligent, personal experiences, while maintaining security and privacy. 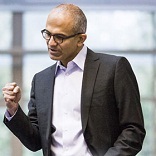 By doing all of this, we will have the broadest impact," Nadella said. Meetul B Patel, general manager SMS&P Microsoft India, said the goal is to unleash the potential of small and medium businesses in the country. "We have the mission that stays with us, how can we get people to do all the things that they can do, or achieve what they can through the use of technology. And we keep doing that," Patel told PTI on the sidelines of the WPC-2014. "We have grown very well. And we know, we have a lot more to do to get India truly, truly on line and truly use technology to unleash everyone?s potential. This remains our driving force in India," he said. Very excited about the technology adoption in India, Patel said Microsoft in India is focusing on barriers to technology adoption for small businesses ? affordability, skill, development applications and how to use it and what it can be applied for. Cloud, he argued, helps in addressing these challenges, which makes technology more accessible, affordable to small and medium businesses in India. "Cloud is now being accepted as a very very viable options for small businesses in India. In fact, a necessary option. So, we see the adoption really accelerating in the last few technologies now," he said. Right now a very small percentage of small businesses are using these technologies. A recent study, he said, has projected the potential impact from greater technology adoption to be USD 56 billion in added economic output and one million in additional jobs. "So, the opportunity is huge," Patel said, adding that better broad band, telecommunication and improvement in infrastructure can help people use and adopt to cloud better. On Monday, Sonata Information Technology was declared Microsoft's India Partner of the year and Bitscape from Ahmedabad won small business partner of the year award. "They have built solutions for small businesses on the cloud," he said.